The Samsung PWR-24AC-16-8UL is a UL listed CCTV power center engineered to manage remote camera and accessory power requirements. 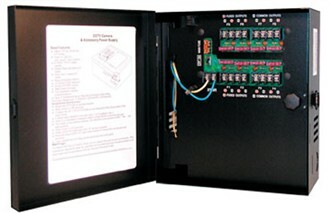 The distribution module is designed with 16 individually fused outputs for powering up to 16 CCTV cameras and accessories. The PWR-24AC-16-8UL power center is housed in a premium heavy gauge metal enclosure and includes transformer and spare fuses. It provides 24Volts AC via distribution to sixteen fused outputs with a total of 8.0 Amps continuous supply current via two 4.0 Amp supplies. The Samsung PWR-24AC-16-8UL has many exciting features for users of all types. The Samsung PWR-24AC-16-8UL is sold as a Brand New Unopened Item.